WASHINGTON, D.C. - U.S. Senator Bob Dole was presented with an honorary degree from the University of New Hampshire School of Law today by Dean John Broderick and New Hampshire's two senators, Kelly Ayotte and Jeanne Shaheen, in recognition of his work as an advocate for veterans and disability rights, which includes the establishment of a fellowship that funds the legal education of veterans. Dole has partnered with UNH Law to establish the Robert J. Dole Veteran Fellowship at UNH Law's Warren B. Rudman Center for Justice, Leadership and Public Policy to fund the legal education of veterans committed to public service. 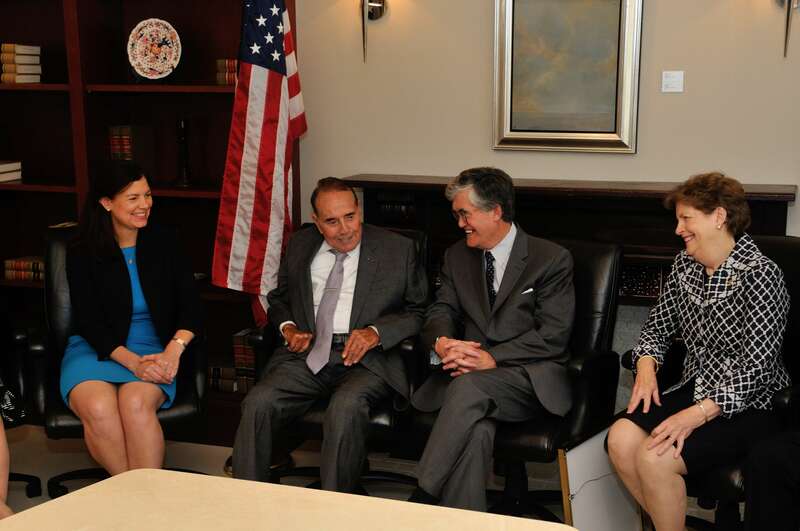 "Senator Dole and Senator Rudman were colleagues in the U.S. Senate for more than a decade, and when he ran for president Rudman served as the senior leader in his campaign," Broderick said. "They shared a bond as veterans and a commitment to public service, and we are honored by Senator Dole's support of and belief in what we are trying to do for young people." A renowned statesman who spent over 35 years in Congress, Bob Dole was first elected to Congress from his home state of Kansas in 1960 and to the U.S. Senate in 1968. He served as chairman of the Senate Finance Committee from 1981-1985. Elected senate majority leader in 1984, Dole holds the record as the nation's longest serving Republican leader. "I am honored to receive this honorary degree and to play a role in advancing Warren's work to train the next generation of public policy leaders," said Dole. "Warren and I shared a strong commitment to public service and efficient government, and I am pleased to play a role in developing this new fellowship in partnership with the Rudman Center at UNH Law." Dole was the Republican nominee in the 1996 U.S. Presidential election and the Republican vice-presidential nominee in the 1976 U.S. Presidential election. Dole currently serves as special counsel at the Washington, D.C. law firm of Alston & Bird. "The honorary degree conferred to Senator Bob Dole is a fitting recognition for a man who has contributed so much to our country," said U.S. Sen. Jeanne Shaheen (D-N.H.). "Senator Dole helped make it possible for many veterans like himself to pursue a legal education and, in turn, allow them to help veterans in need, and the impact of his work and contributions will continue for years to come. I congratulate him on this honor." "Senator Dole is a great statesman who has devoted his life to serving our country - from his brave service in World War II to the floor of the U.S. Senate," said U.S. Sen. Kelly Ayotte (R-N.H.). "He brought tremendous leadership and decency to the debate on Capitol Hill, and this honorary degree is a fitting recognition of his decades of extraordinary public service."